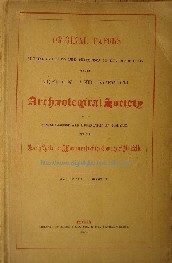 About this book/synopsis: This paperback publication serves several purposes, the main two of which are firstly to update members of the Norfolk and Norwich Archaeological Society with what the society has been doing during 1935 and how it stands financially and in terms of membership, etc. ; and also secondly to publish original papers of which there are six. The publication includes 13 black & white illustrations mostly related to the stained glass and sepulchral brasses papers. For anyone interested in seeing what their ancestor was up to in the society, there are lists of all the members and notes on their roles within the group from president to Librarian to Honourable Assistant Secretary. At Great Yarmouth, there had been drastic demolition of some of the historic rows and the levelling of St. Nicholas' Churchyard. The Great Yarmouth Historical Buildings Ltd had acquired the fine 16th Century plaster ceiling from the demolished Star Hotel. The Society's Annual Trips: Details are also given of the society's two annual trips, one to Deopham, Morley Old Hall, Great Ellingham, Wymondham and Stanfield Hall, all on the 16th May; and the other to Barningham Hall, Gresham Castle, Weybourne and Salthouse on 27th June 1935. Meetings: Monthly meetings were inaugurated in the winter of 1934-1935. The Dean of Norwich, Miss Helen C. Colman, Mr. Hugh Braun, Mr. A. B. Whittingham and Professor Atkinson all gave talks. A talk on "Norfolk Dialect and Folk Lore" was given at the Stuart Hall by the H. M. Lieutenant for Norfok (Mr. R. J. Colman), the Rev. C. H. Fitch, Mr. Bertram Steward and Mr. B. Knyvet Wilson. Dec. 13th, 1935 - "The Ethelbert Gate" by Ernest A. Kent, F.S.A. Jan. 31st, 1936 - "Binham Priory" by H. R. Nevill, C.I.E. Feb. 28th, 1936 - "Woodhenge, Arminghall," by Dr. Grahame Clarke, F.S.A.